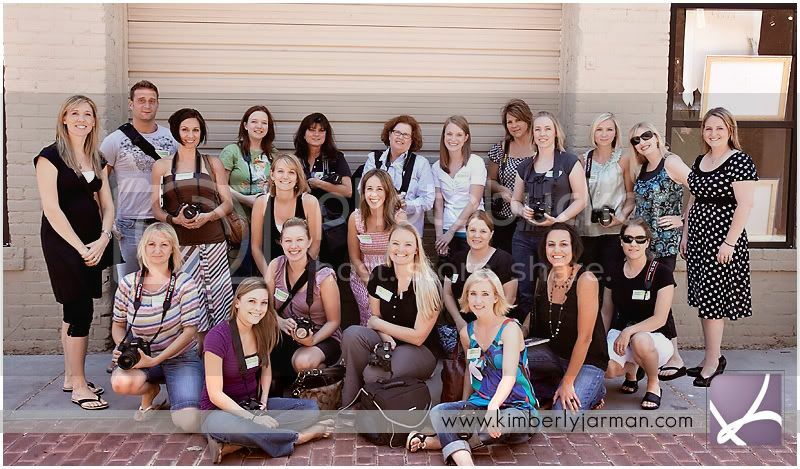 Two weeks ago Jennifer Bowen and I held our 3rd Create Better Images workshop. We have had a lot of interest in these workshops and when we announced our Beginners and Intermediate workshop we sold out within 2 weeks! We were shocked and so honored that people wanted to come and learn from us!! Thank you so much for all those that attended, we had an amazing time with you all. Before I begin with the recap I have to give a huge thanks to our sponsors for this workshop. 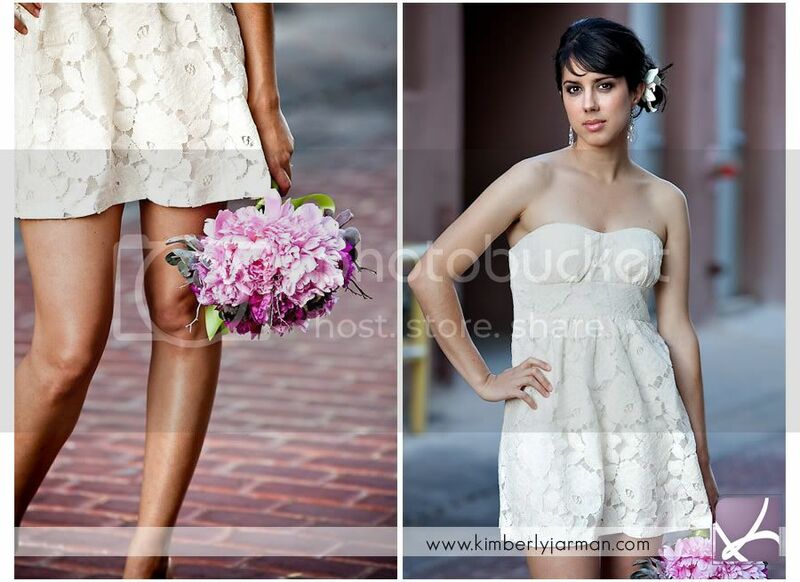 ZuZu's Petals in Downtown Mesa - they provided the beautiful centerpieces in our detail pictures below. 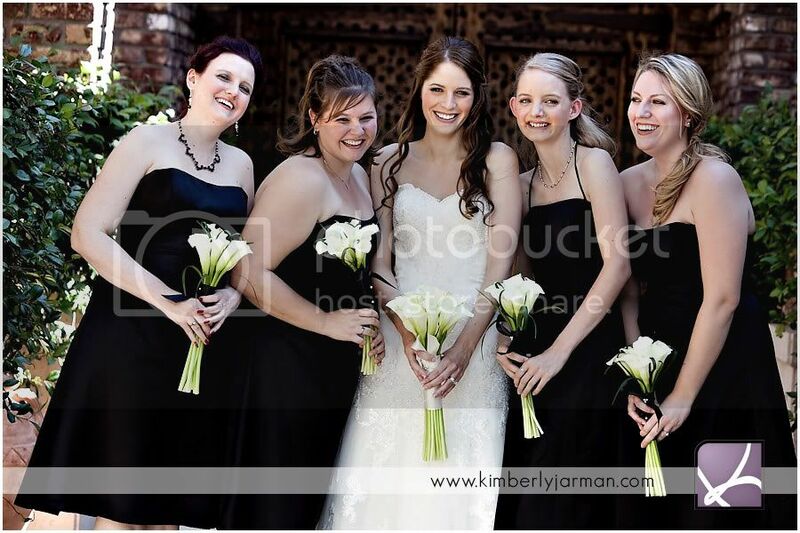 Gina, owner of Fiori Floral for providing the beautiful boquet for our Bride and Groom shoot. For those who want to learn more about these workshops, we have created a blogsite which goes into detail of what the beginners and intermediate class entails. To give a little recap, the beginners class if for those who want to learn how to use their camera better and how to take better pictures. 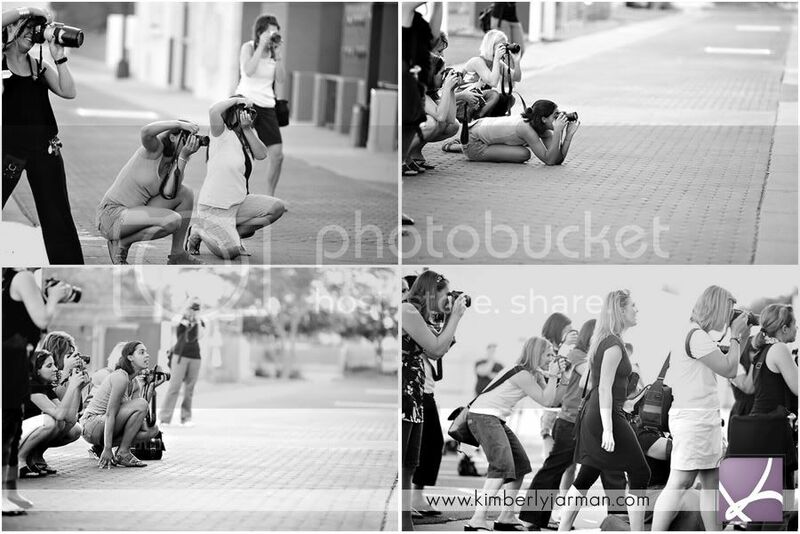 We teach the basics and teach people how to take their camera off the little green box and learn how to shoot manually. Our Intermediate class goes more in depth by teaching posing techniques, client interaction, and we also have a model shoot. It's all a lot of fun and there is so much that happens throughout the day. We started the day early with our beginners class and had a lot of fun with them. Jennifer got some really fun shots of the attendees taking pictures of her while learning how to practice backlit photography. We had a packed house with 20 begginers!! A group shot of all the Beginner attendees!! We then moved into the Intermediate workshop after a short break. A few of the beginners attendees also attended the Intermediate workshop, which proved to be a great thing for them since they were able to work on the skills that they learned earlier in the live shoot. There were a ton of cameras, people, and chaos, but we had a lot of fun. 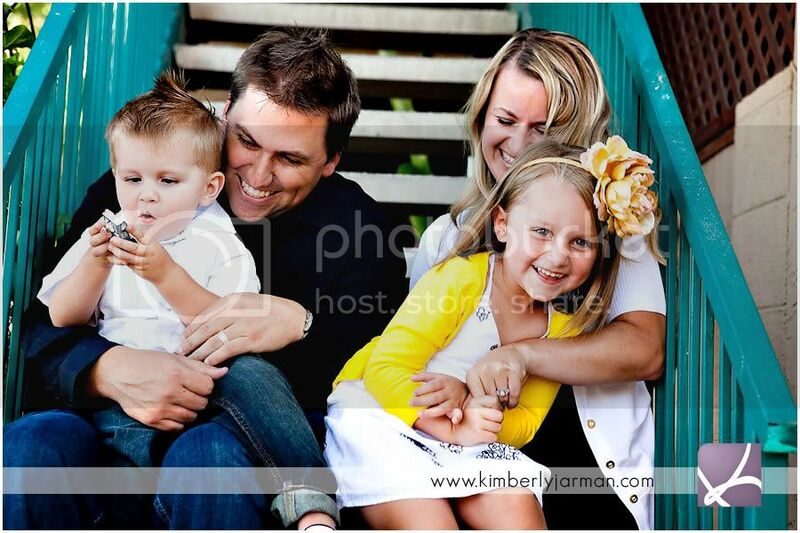 The wonderful family we were shooting were such troopers!! 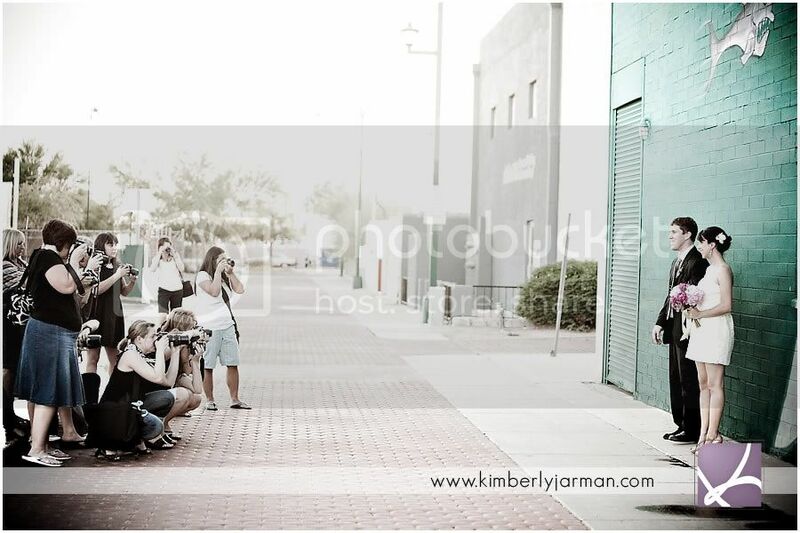 Can you imagine 20+ photographers taking pictures of you... the kids were a little overwhelmed, but they did great and we got some amazing shots. 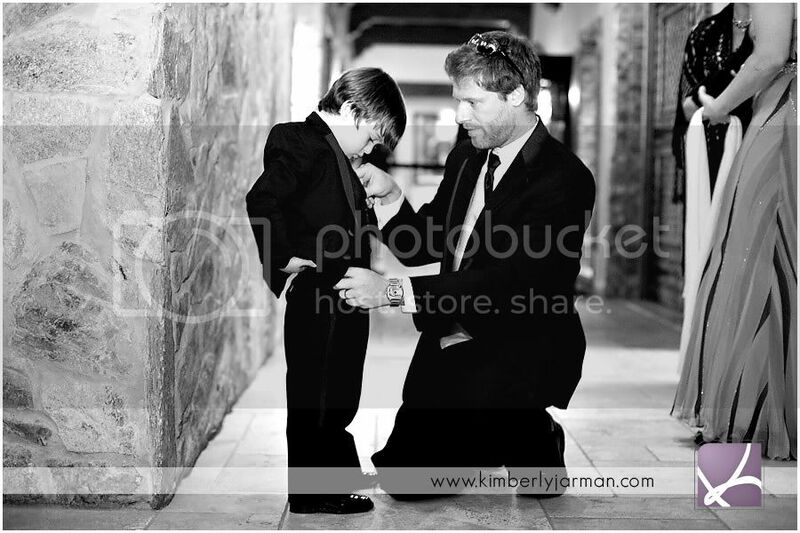 Jen and I both showed the attendees how we would work with a family and directed part of the shooting. We then let some of the attendees direct a little as well. Yes, overwhelming for the kiddos.. can you imagine? LOL. We actually had people pulling over on the side of the street asking us what was going on. The 2nd part of our live shoot was with Cristi and her cousin... funny story! 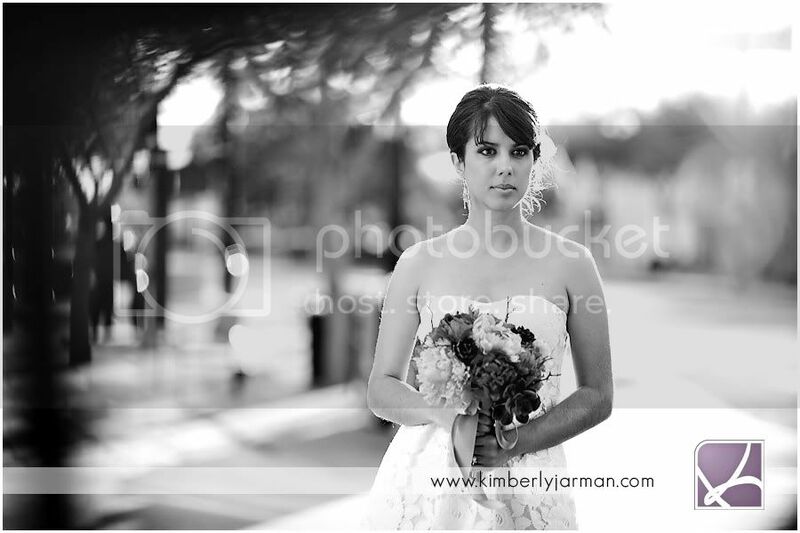 Cristi's husband was out of town for the shoot, so she asked her cousing to step in as the groom. It did end up giving us a few laughs but they were both troopers. 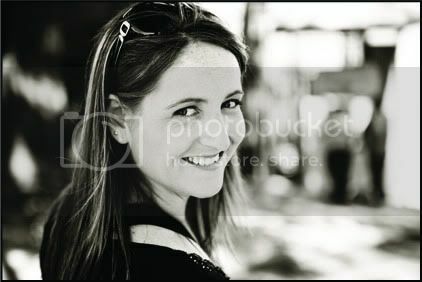 I got a ton of great pictures of Cristi, she is beautiful. And a huge thank you to to Gina, owner of Fiori Floral for donating this gorgeous bouquet! 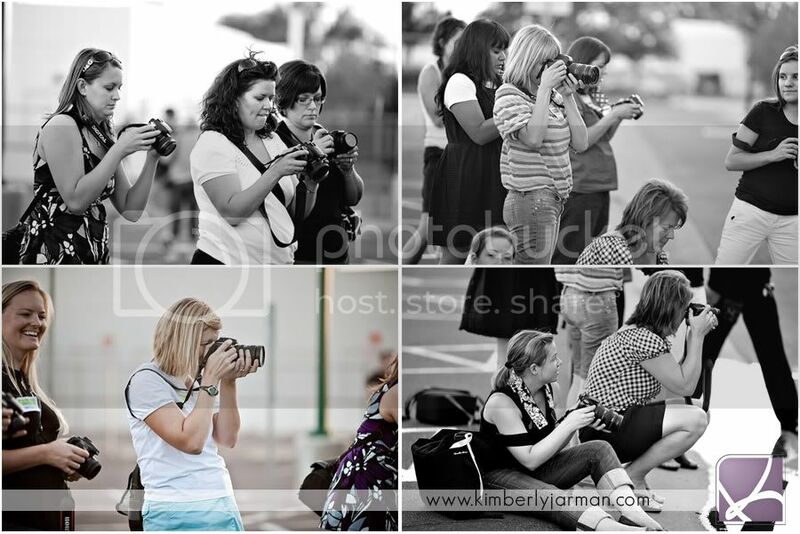 Here are a few more pictures of all the attendees shooting. What a fun day! 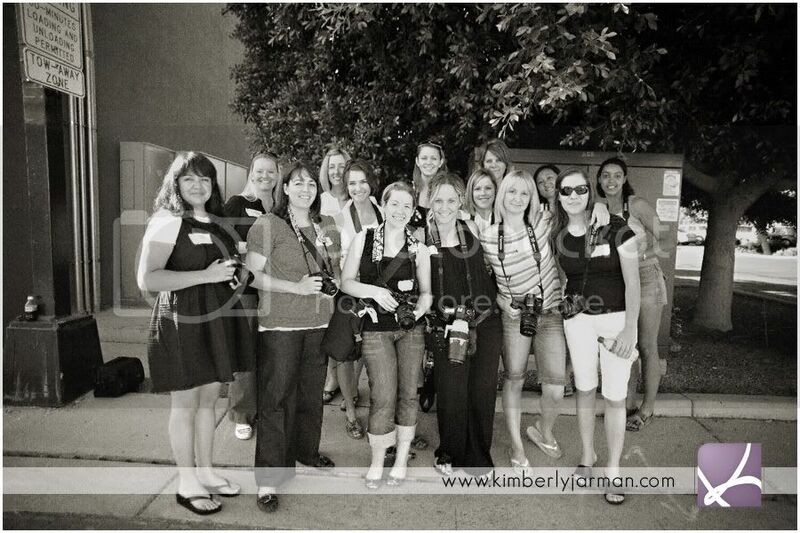 Cristi, our wonderful model/photographer friend took this picture of the intermediate group. A few were missing and i'm so sad we didn't get an entire big picture of us all. Thank you everyone who attended. We really enjoyed having you. For those of you are still interested in our workshops, we will be announcing the next one in a few months so continue to check up our blogs so that you can jump in as soon as it is announced. 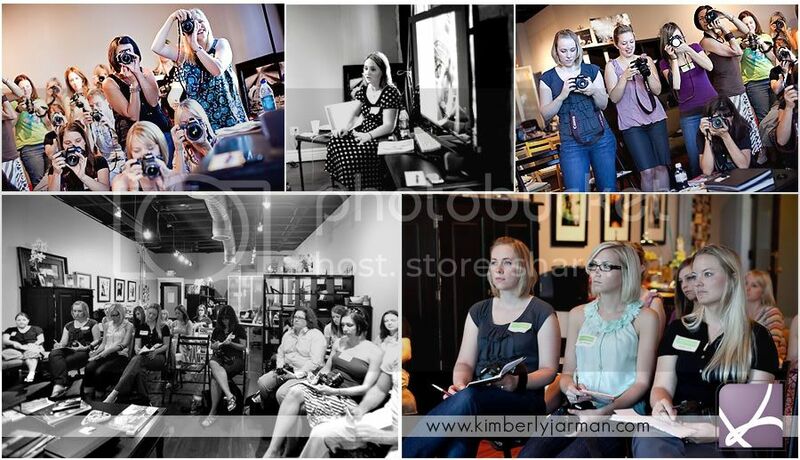 To read some blog reviews by those in attendance, click here, here , here, here, here and here! 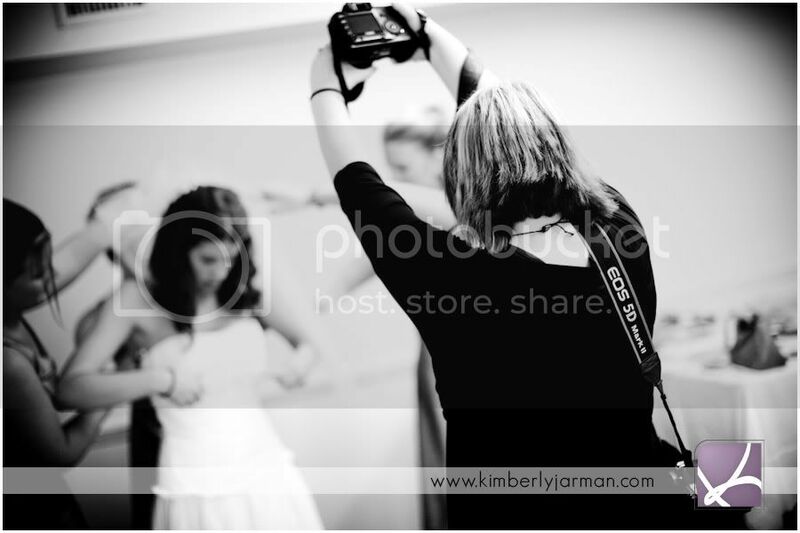 To learn more about our workshops in general and find out details on the next one, click here. Ummmm... HELLO GORGEOUS!!! 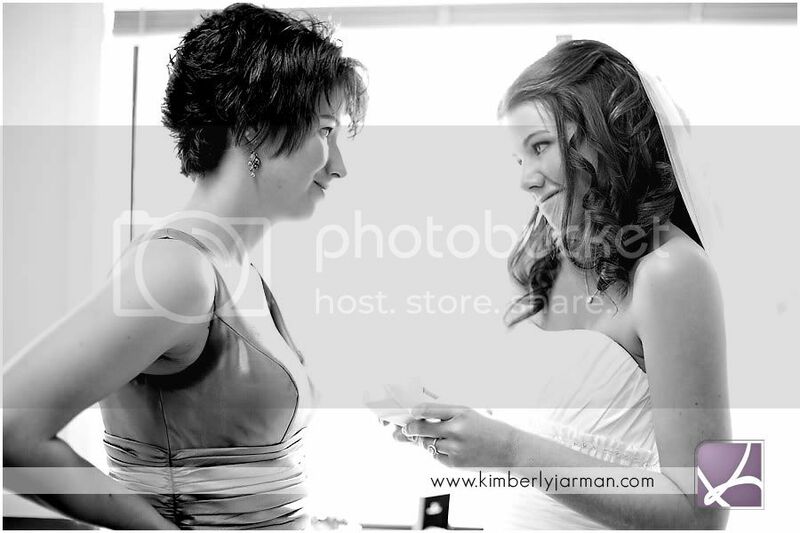 Ok, now that all of that is out of my system I can now tell you all a little more about my wedding on Saturday. 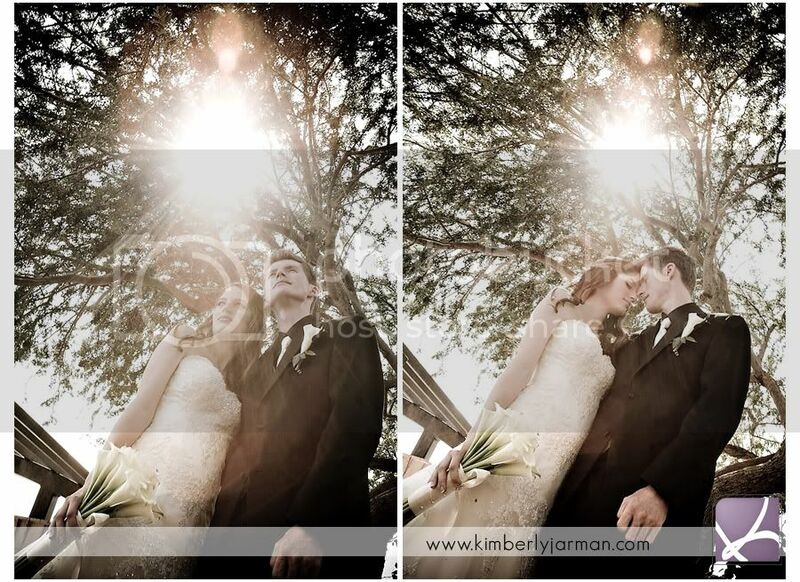 Kim and Nathan were married on a beautiful June day in Scottsdale, AZ. 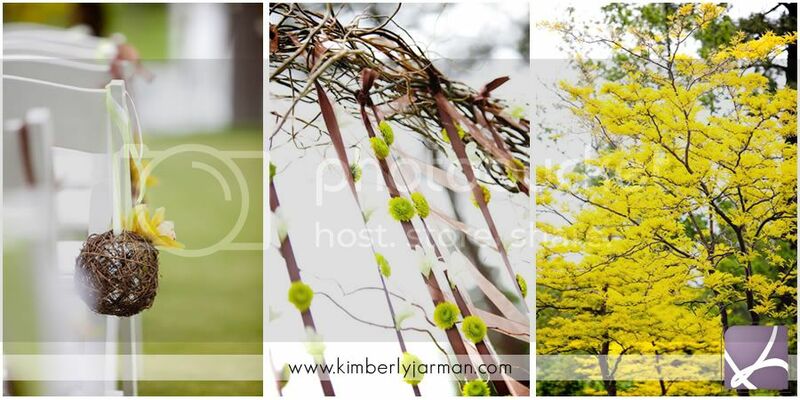 Now many of you might laugh and say, Kim, how can it be a beautiful day in June??? 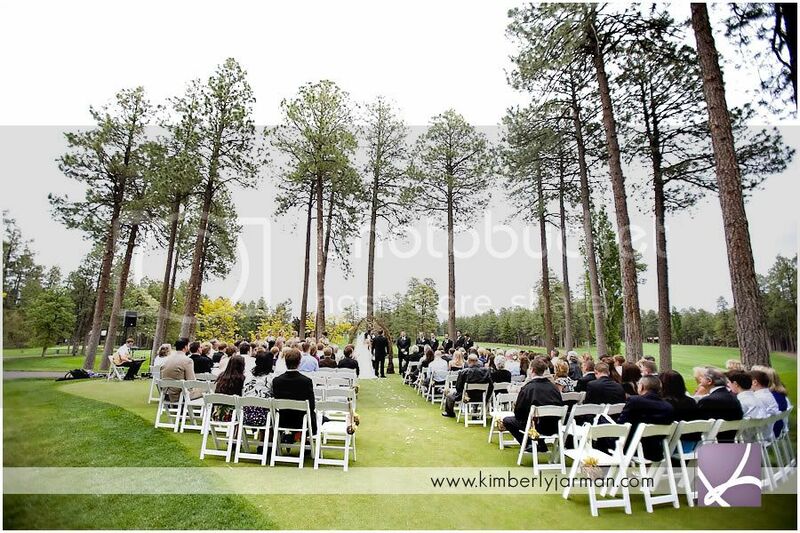 Well let me tell you that God has been very kind to us over here in AZ and it's really been below 100 degrees (which for us is amazing) most of June, so I was thrilled to say the least when Kim told me that she was moving her ceremony from inside to outside and that the weather was going to be amazing! 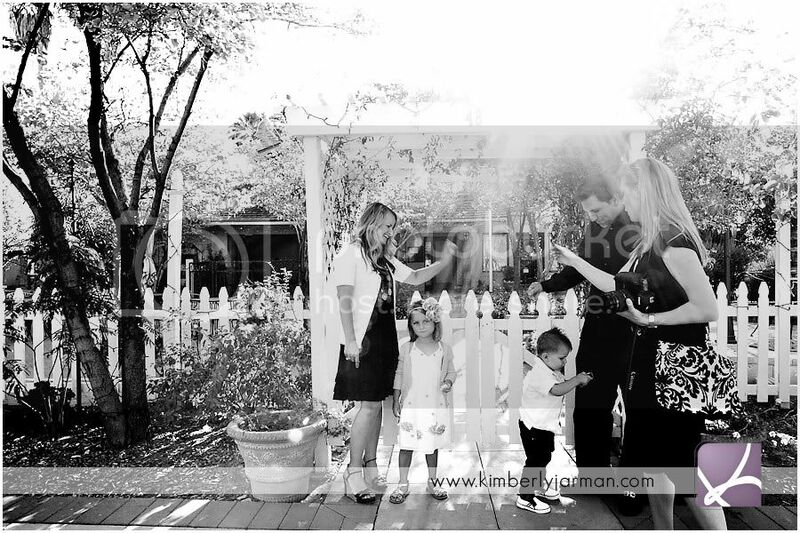 Kim and Nathan were married at Sassi, up in North Scottsdale. 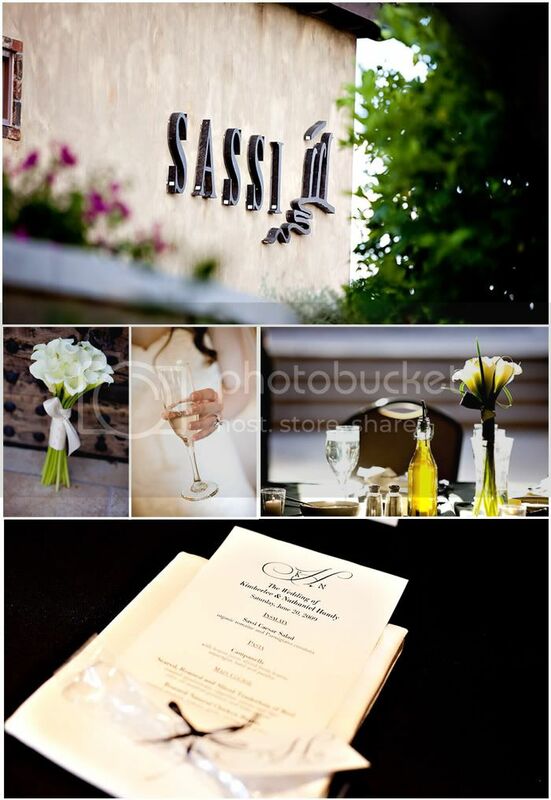 Sassi is a quaint and beautiful wedding location and it was wonderful shooting there. 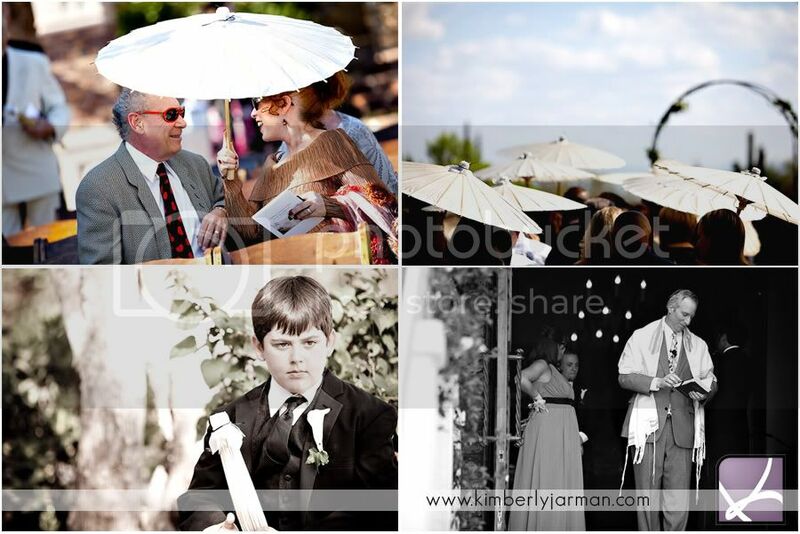 I had a great time with Nathan and Kim's family and friends on Saturday and we got some amazing pictures!! I love that she got ready in a suite with good natural light. It totally made a difference for the pictures and also gave the girls enough room to move around in and get ready! Huge props to Kim on that decision. 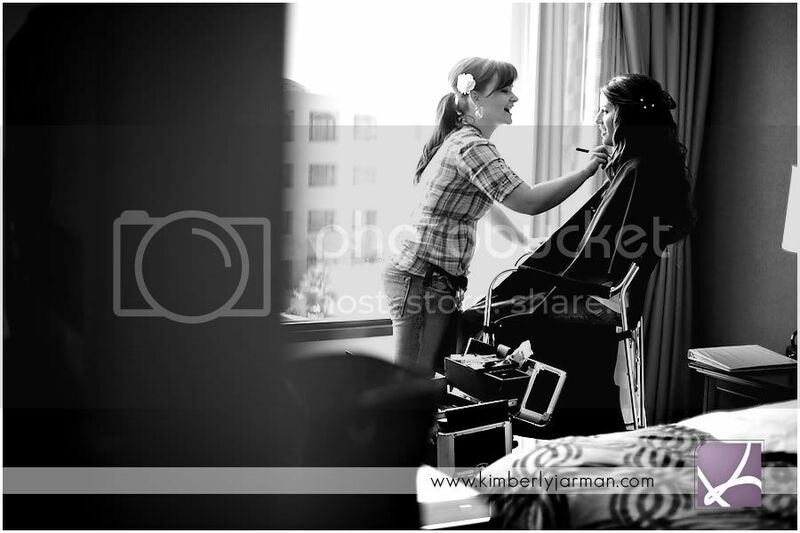 I love this getting ready picture. One of my newest favs. Kim's mom did a deodorant spray for all the girls. LOVED IT! The wedding was at Sassi, and it really was a beautiful day. 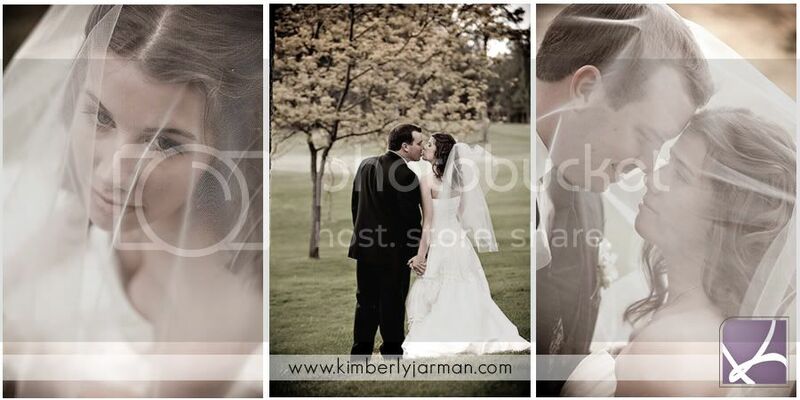 Kim and Nathan are very very photogenic and it was great seeing all the pictures that we got that I LOVE! 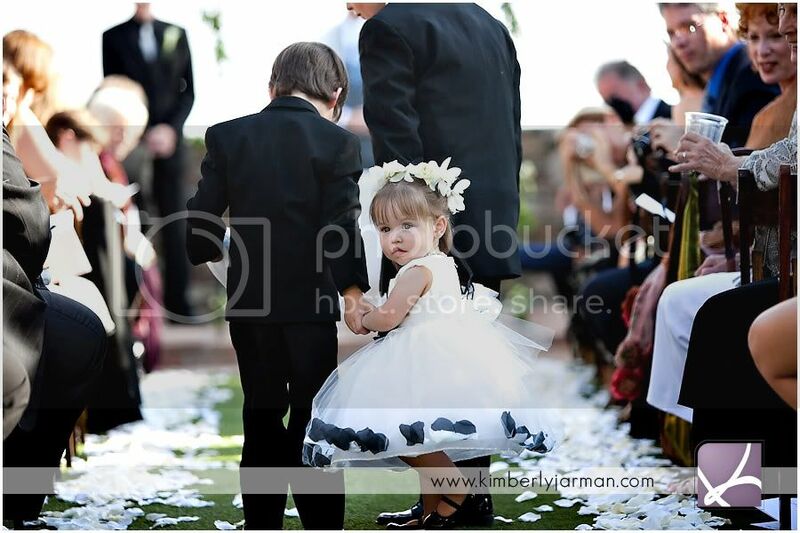 The kids in this wedding were super super cute and I think I got way too many pictures of them. But look at these kids and tell me you wouldn't have done the same! 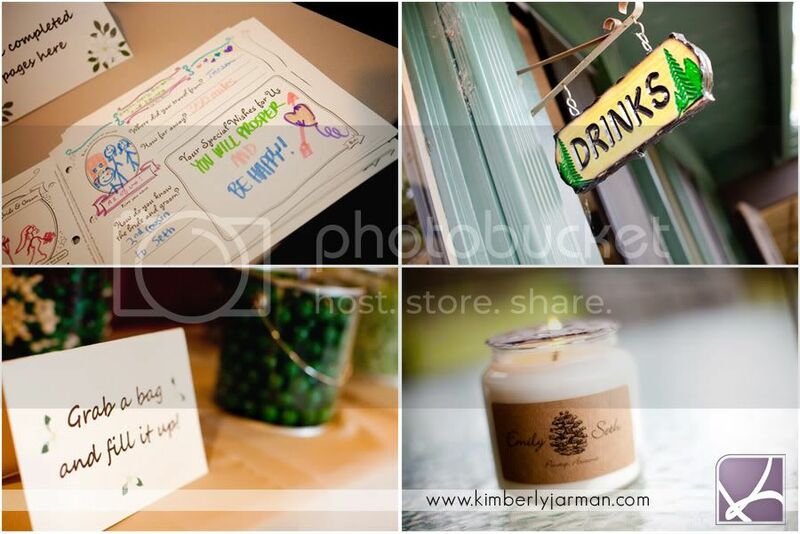 I love how Kim got Parasails for all of her guests! Father Daughter Dance and First Dance. Beautiful! 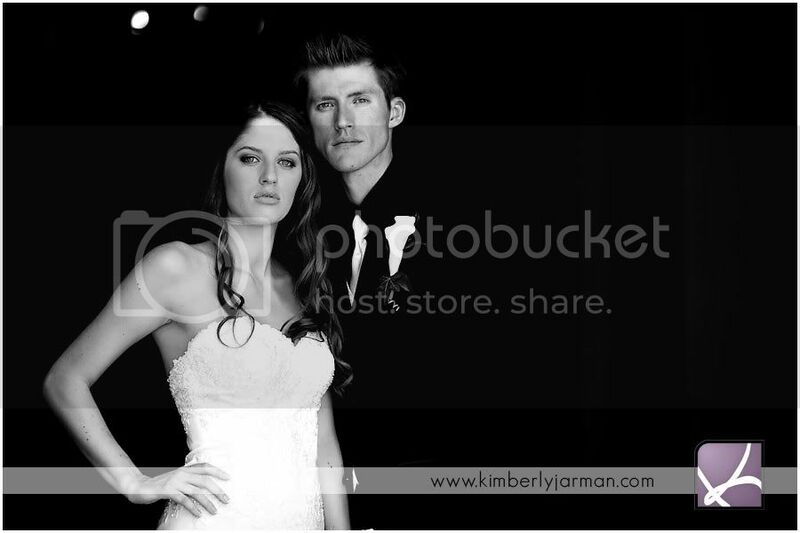 Thanks so much Kim and Nathan, I had a great time!!! Hmmm, I just noticed it's been since June 2nd that I posted. I can't believe it's July next week, so i'm shocked and stunned. We've been a little crazy over here.. there is lot's a brewing and lot's a shooting going on as well. 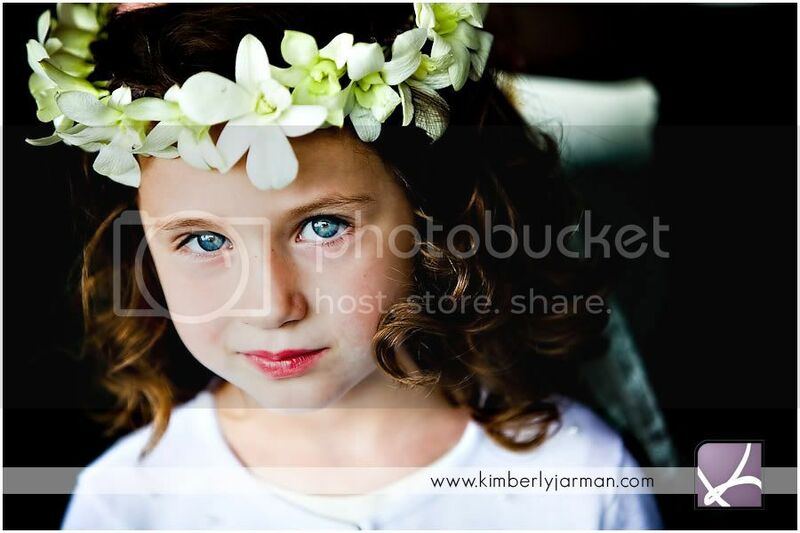 To post still is a family session from Pinetop, a lovely session of my beautiful daughter, excitement over being published in Phoenix Bride and Groom, a bridal session, a wedding, and multiple other items. So I promise that there is lots to share, I just haven't had a chance to sit down and post it all. That all said to tell you that they are coming... don't give up on my loyal and faithful blog stalkers. There will be much to come soon!!! 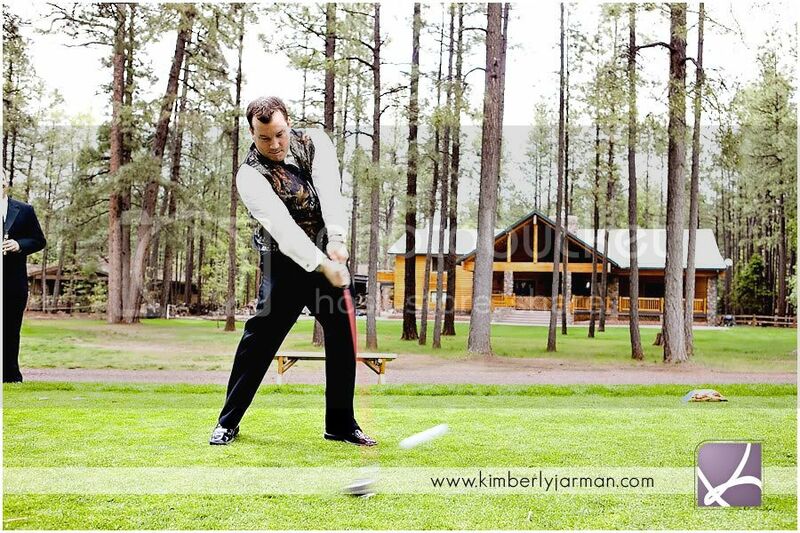 I'm in my hometown of Pinetop, Arizona this week doing sessions for anyone who is interested. Today, I photographed a beautiful Senior, Mariah. She is going to be graduating this coming year from Blue Ridge High School. I sent out a casting call a month or so ago to the Blue Ridge High School Class of 2010 for Senior Models, and Mariah was the first to sign up! We literally just finished the session less than 3 hours ago, but I had to post up a sneak peak for Mariah, because she did so amazing. I'm so eager to go through the rest. 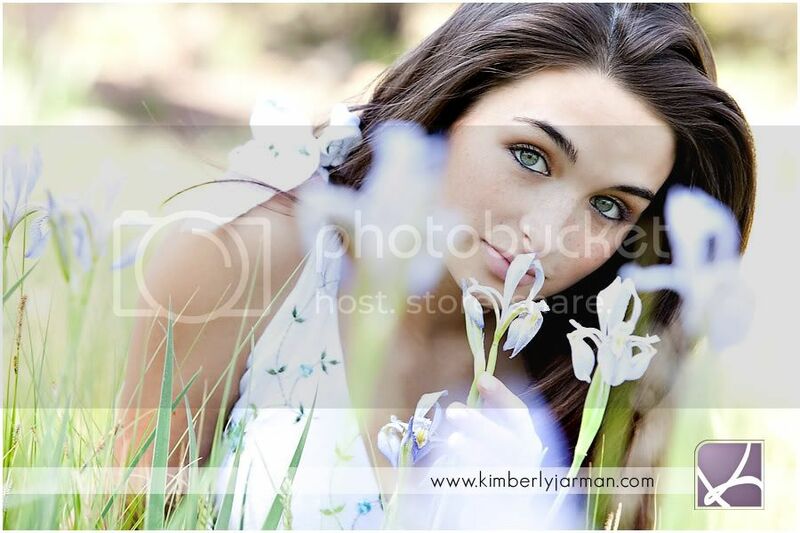 If you know of any Seniors who want to get totally unique senior pictures have them give me a call. Stay tuned for more, cuz they are gonna be great!!! 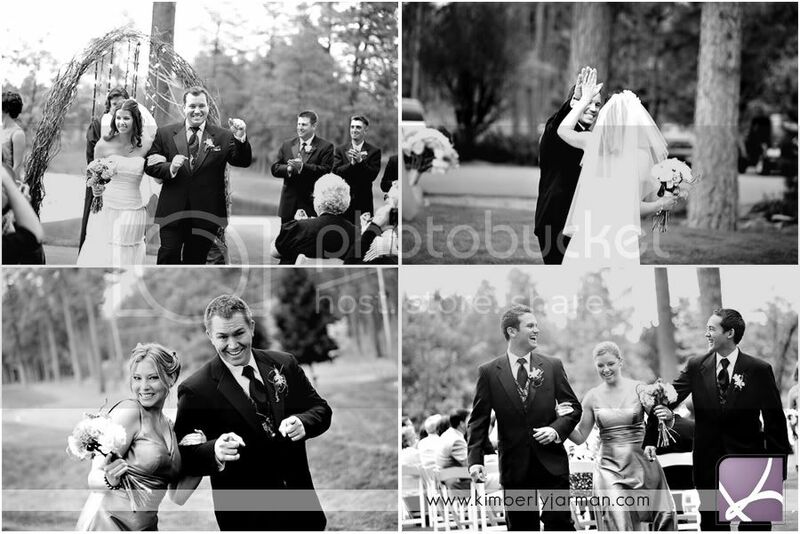 Seth and Emily were married in my hometown this last Saturday, Pinetop, Arizona!!!! 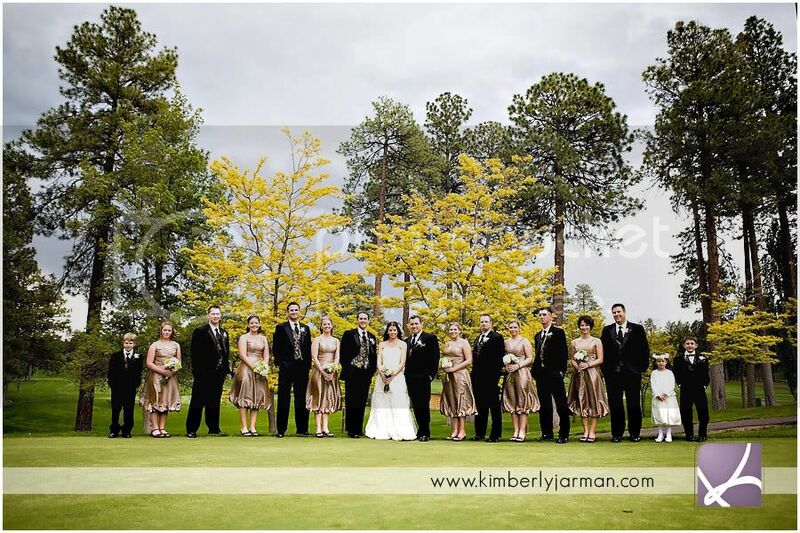 They were married at the Pinetop Country Club, and it was an absolutely amazing day. It rained the entire week before so everyone was wondering how the day was going to go, but things worked out! 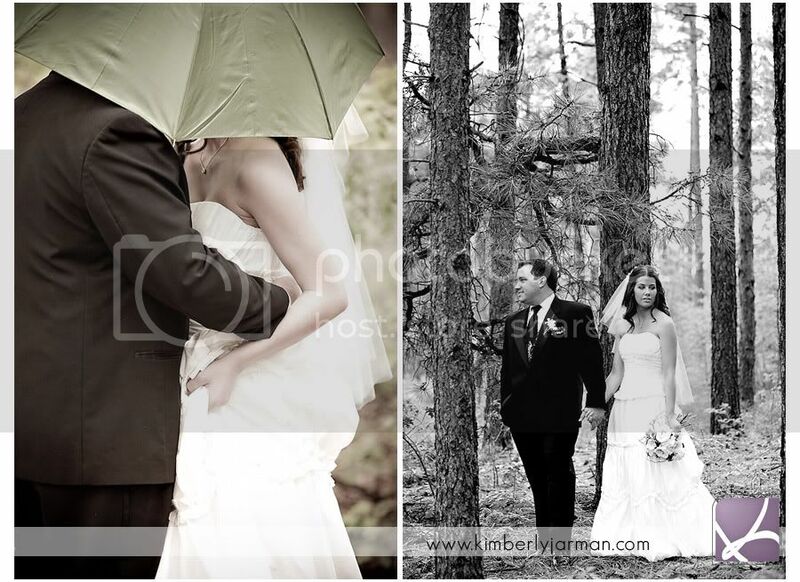 There was rain, but only once we had finished the pictures that we needed and once the outside ceremony was over. I swear i'm the luckiest photographer ever! 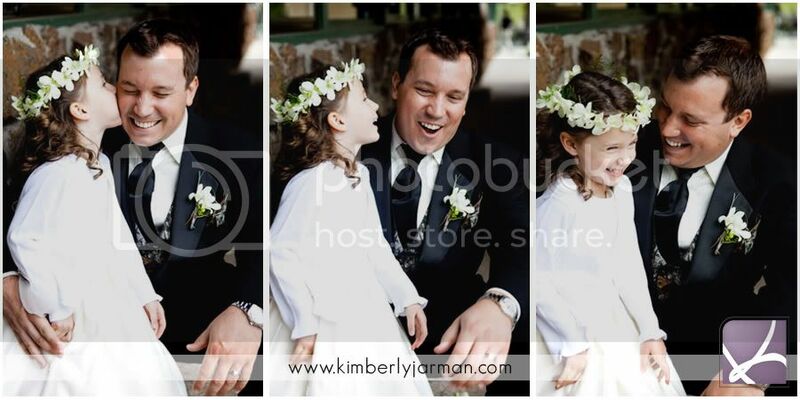 There are so many pictures that i'm going to share with you all because it really was a spectacular day. A ton of details and amazing moments. I also had the wonderful pleasure of having my very good photographer friend, Jennifer Bowen, come along and shoot with me. 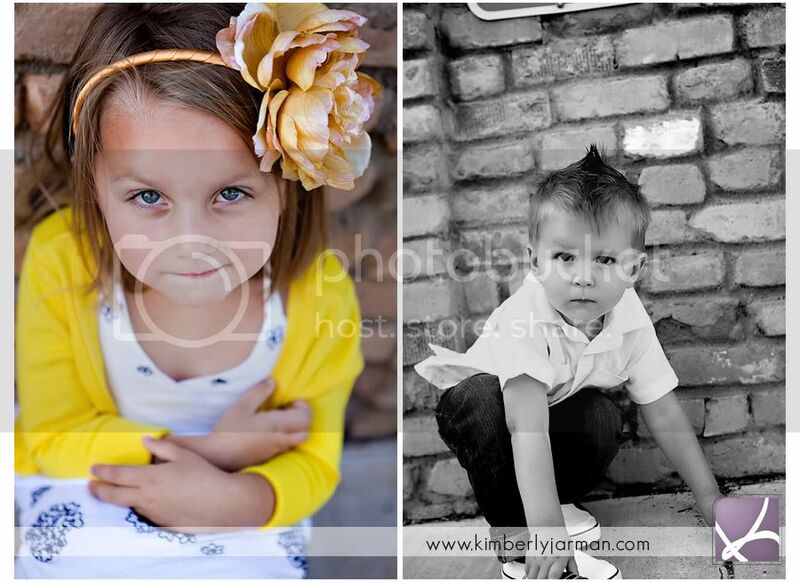 I have included a few of my favorites that she took below.. i'll be sure to point them out! I loved all the Pinecones that they used. It really made for some fun details. Jen got this great shot of Seth's cufflinks. I love this moment between Emily and her sister. More details.. Aren't these rings gorgeous? Jen hung out with the guys and nailed a very cool shot of Seth playing golf. Look at the ball in motion! And I LOVE this shot... 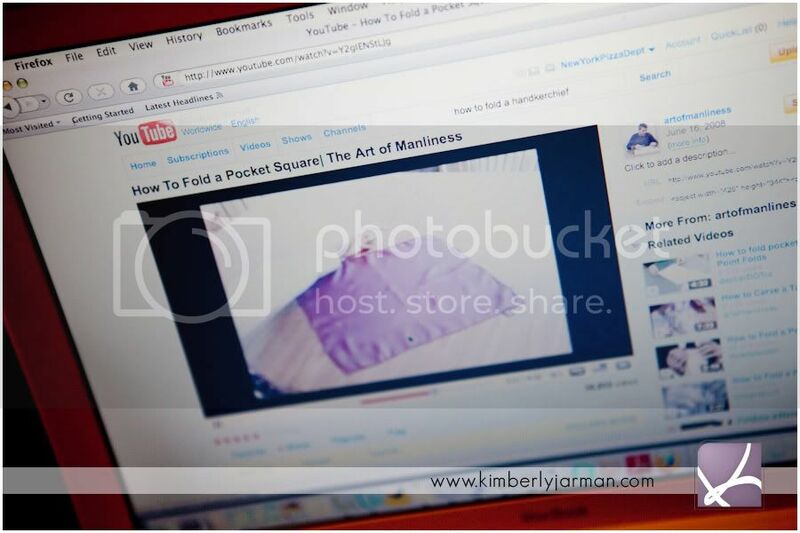 I didn't realize what it was when I first saw the picture and then I saw that the guys were watching YouTube to figure out how to fold a pocket square!! Awesome. 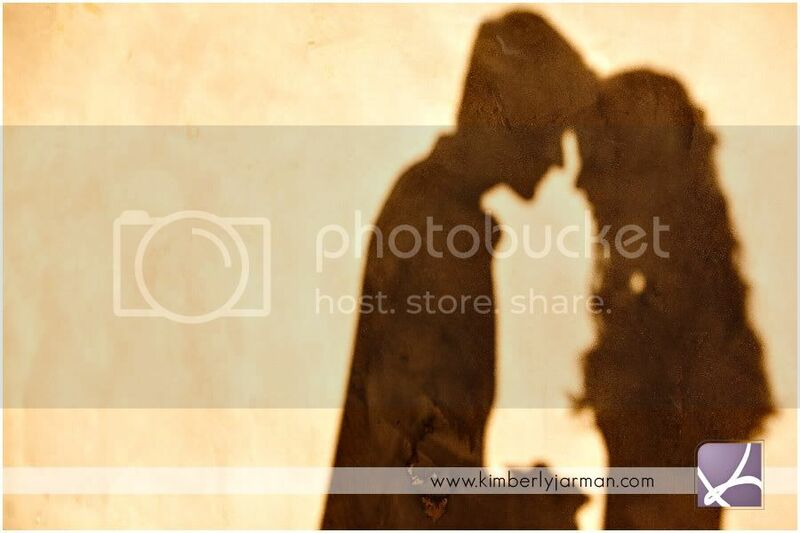 I Love it when Bride and Groom's see each other before. Jen got an amazing shot of Emily coming out the door and I got this great shot of Seth's reaction. Timeless!! 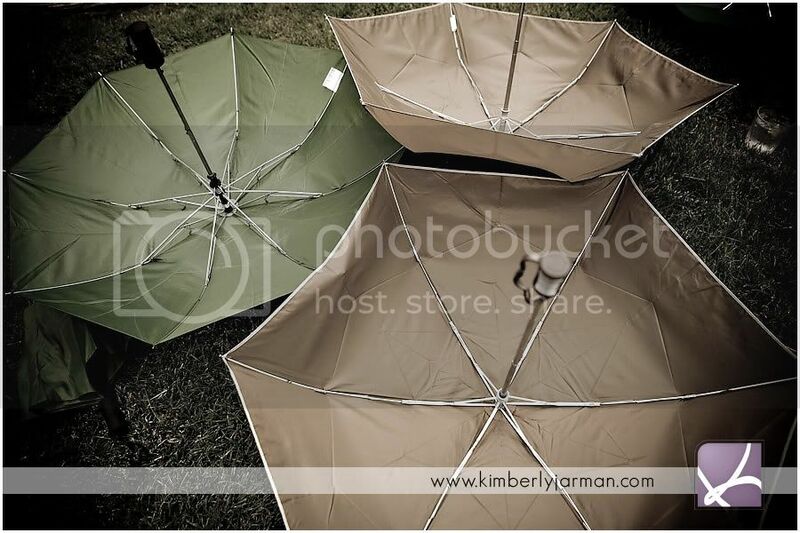 Jen set up this awesome umbrella shot. I have to give her credit for the setup.. I love it. One thing I love about Pinetop is that you have green... yes green and colors and it's not desert! 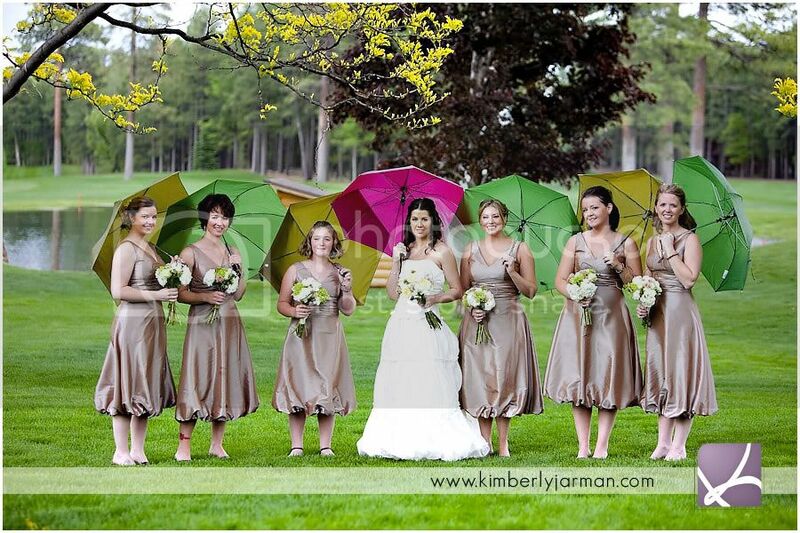 I love this wedding party picture with all the color around! And look at those clouds.. it had just stopped raining so we could get this shot. 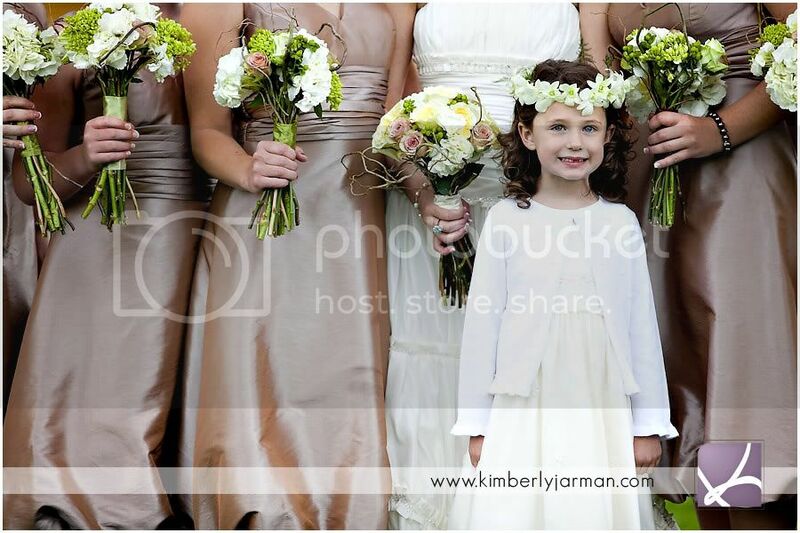 Jen got this amazing shot of the little flower girl. She was so precious. But Umbrellas do make for great shots! Again, this little girl was so so so cute! I LOVE this shot. 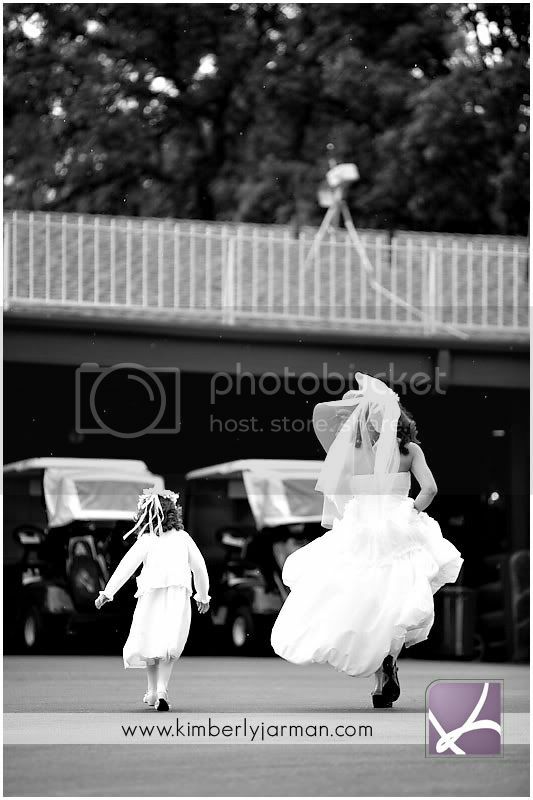 It started to rain just as we finished the girls pictures so Emily and the little flower girl were running back to shelter. She made everyone smile all day long! 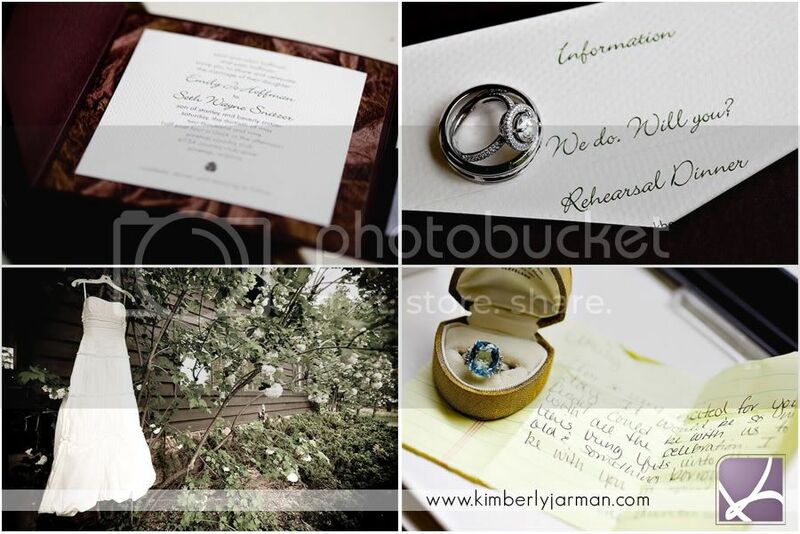 Amazing details of the ceremony. 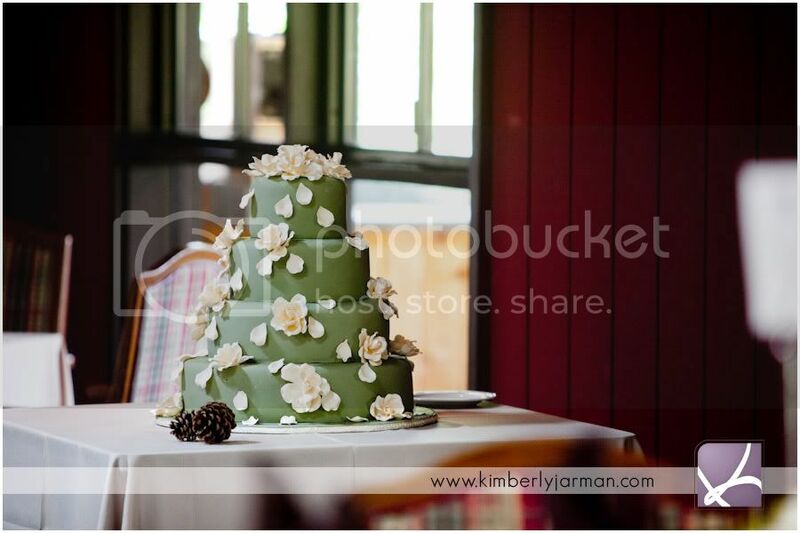 Courtney with All Occasion Florals did an AMAZING job with all the flowers. I totally recomend them and they are local to Pinetop! I Love the picture to the left because of the Ushers. They were so much fun. Also the guitarist was AMAZING!! 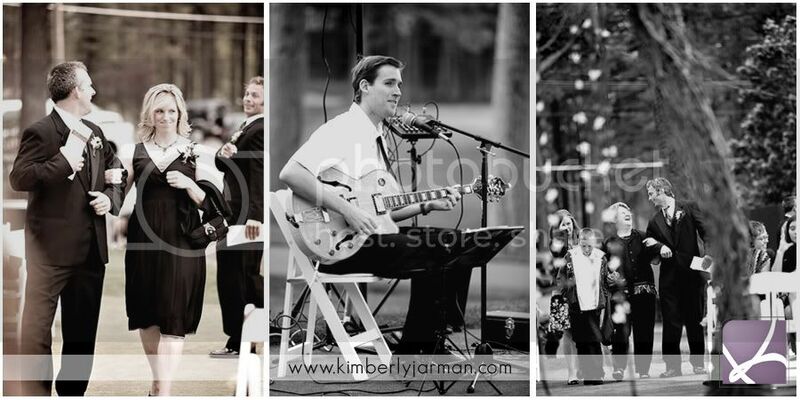 His information is below and I hear he is a valley local and trust me, you want him to sing at your wedding. 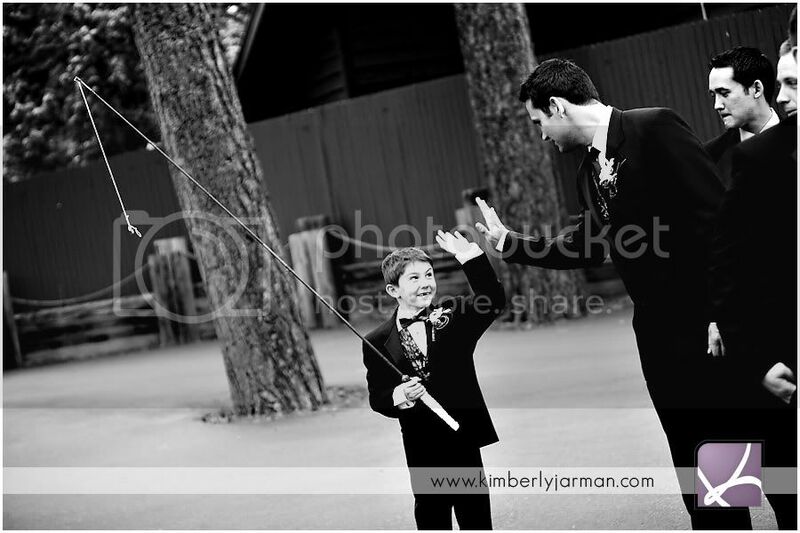 When Seth proposed he proposed by putting the ring on a fishing pole, so the little ring bearer walked down the aisle with the rings on a fishing pole. So cute. Love this shot Jen got. The little guy that Emily is hugging is her brother. 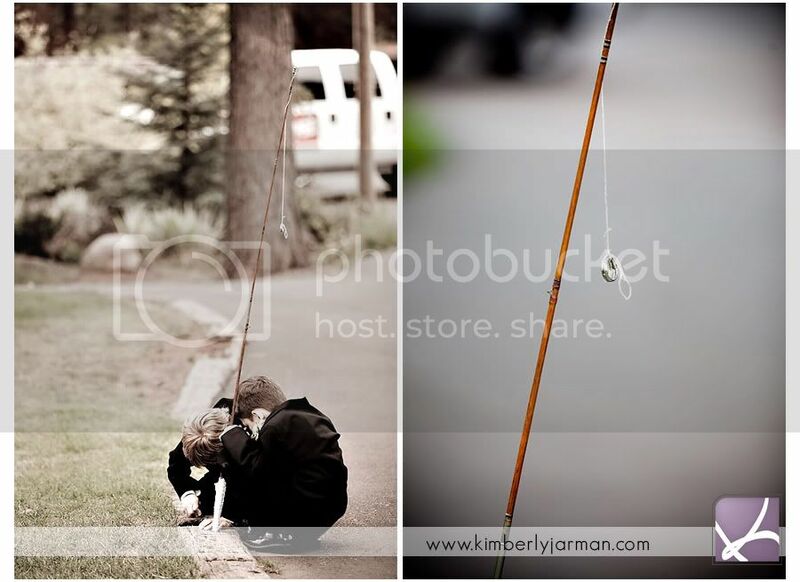 He was crying at this point and Emily gave him a hug... such a special time... another one that Jen caught. 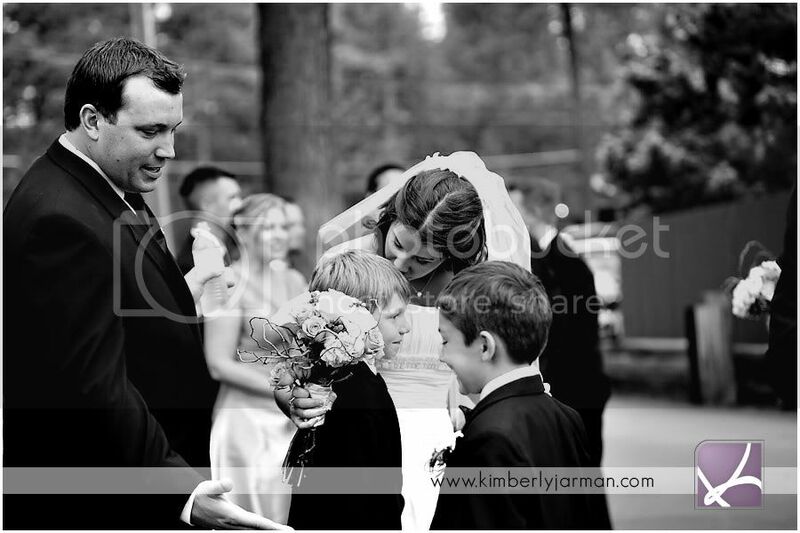 Pinetop, Arizona - This wedding was amazing and there were so many details. 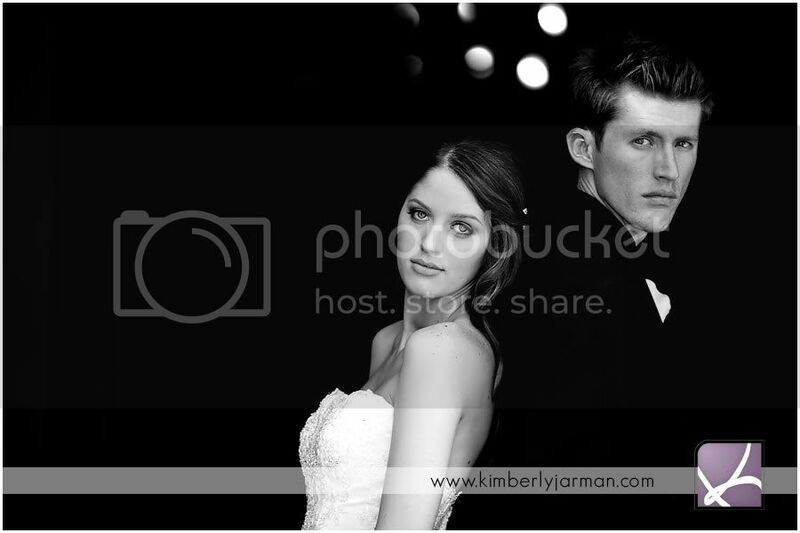 Thank you Seth and Emily for allowing me to be a part of your day. The wonderful thing about having friends shoot with you is that they get some great "In Action" Shots. 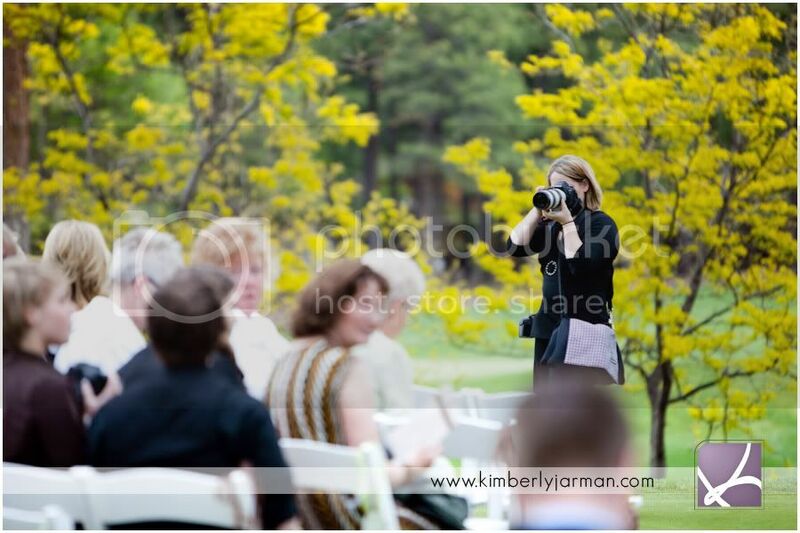 Jen got some really good shots of me in action and I wanted to show them off. I love these next few because it shows you me shooting and the shot that I was getting. How fun!